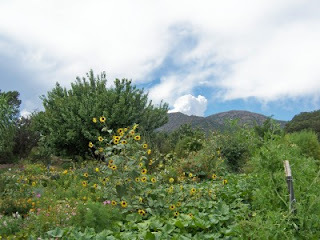 Santa Fe Journal: Mountain Flower Farm in Cedar Grove. 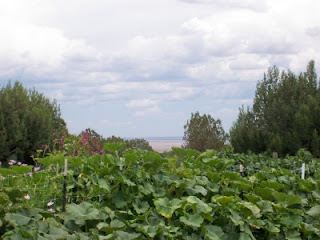 Mountain Flower Farm in Cedar Grove. 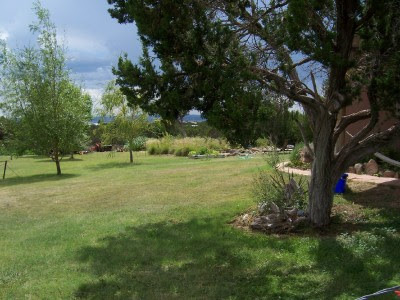 This farm sits at the base of South Mountain amid pinon and juniper. 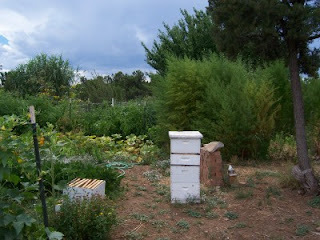 They grow a mix of cut flowers and produce, sold at the Santa Fe Farmers Market and the Cedar Crest Farmers Market. The people that run this place are lovely--he is from Switzerland but their spread resembles something out of Sound of Music (Austria, Switzerland, whatevah). Our family sampled cucumber and tomato salad, fresh bread, and the best water we've ever tasted (no kidding). 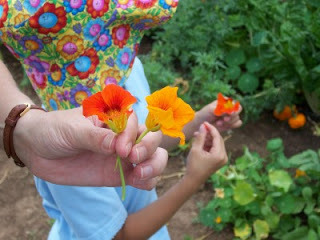 We sampled potently sweet purple grapes from the arbor as well as a nasturtium, an edible--and spicy-tasting--flower.